Incredible footage has emerged from the northern Brazilian city of Fortaleza of a dramatic rescue of a young woman by a member of the Brazilian fire service. In this dramatic video, a woman – who appears to be having an argument with someone inside her apartment – suddenly emerges from the 10th floor window and looks like she’s about to jump to her death in the street below. A man in a window to her left appears to try to talk her down, and that’s when the brave firefighter in the apartment above her decides it’s time to take action. How does he do it? Watch this amazing video to find out. WOW! Nice drop kick there! It’s certainly an unconventional rescue, but you have to admit it’s effective. Until we saw the above video, we didn’t know the Brazilian fire service employed ninjas! Previous articleHere’s Something You Don’t See Every Day – A Fox Making a Sandwich! 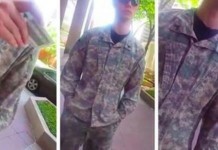 Things Get Heated As Retired Marine Confronts Stolen Valor FRAUD! 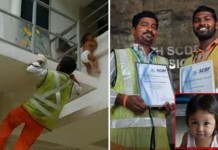 Singapore Worker Hailed As ‘Hero’ After Incredible Toddler Rescue!